So far I've got vendor trash that sells for 25g, random rare items, and 2-3 elder charms. These are all the coordinates from the map above and comments below as of March 21st. March 6th, 7th - Updated to include co-ords from replies to this comment and Maguy (below), thanks guys. March 9th - Added Macro 3, which includes all the new locations from pins on the map (removed duplicates). March 21st - Cleaned duplicates out. Added Macro 4, all new coordinates. Source is map from the link above. On finding more than one chest a week... I can confirm that you can loot more than one chest a week (I just looted two in quick succession on a low population server). I believe that this is due to server lag in detecting whether or not you have looted a chest. As Karsteck says below (reply to one of the hidden, down-rated comments): "The hidden-quest doesn't flag complete until about a minute after looting one, and yes, you can actually loot another in that time window. A guildie of mine was able to loot a 2nd chest right after his first of the week." Please stop down-rating people who say you can loot two (or possibly more) chests a week just because you believe it isn't true. It's entirely possible if you scope out a couple chests before you loot the first one, or play on a low-pop server. I cannot say exactly how long this window is, as I was only able to find two chests in under a minute. In addition to items already stated, these drop Shan'ze Ritual Stones, which are used for Taran Zhu's quest. All the Troves are available in Stage 1 of your server's progression except the ones in 58, 39.6 and (Unconfirmed) 59.3, 56.8 seems to be just inside the walls. These require no keys or anything to open, you simply have to be lucky enough to see them before anyone else does. Good luck. Awards the achievement "Thunder Plunder". anyone know what the respawn rate for these are? On the live server I found a cache not marked on the map so I'm assuming there are several more spawn points not yet listed. Uses the same model as the Ancient Guo-Lai Cache but it does not require a key. Well i found one of these around the court of bones in a room underneath. when i approached it i was in combat, i tried clicking on it to open it and nothing was happening, the little cog was greyed out. i got myself out of combat thinking that may work... nope still greyed out and could not open. i asked in general chat do i need to have a key of some form to open it? the answer was no. Then along came another player and opened it right in front of my eyes after i had been trying for around 5 minutes. He got the achievement and all the loot. To say i am annoyed is an understatement. I have submitted a ticket which may or may not be answered within the next 6 weeks. When i get a response i will update. Has this happened to anyone else? I found one but I was going to let a friend loot it but he couldn't see it. He said it happened to him before. Any idea why? Can anyone confirm looting 2 chests. Its been implied these phase out for a week after looting 1. The macros that are used for the coordinates for the troves, do those macros work with a specific addon by chance? I created both macros but they do nothing and i'm not getting any respoonce from the macros :(. P.S. I don't use them much so i am a noob when it comes to macros lmao. After having looted a chest of my own earlier, I couldn't see a chest my partied friend was pointing at, followed by him looting it. I would like to know more about this strange behaviour, if it is indeed true that you can loot more than one per day. it is important to note that you can only find these once a week, as has been stated by others here you can not see another chest after you have found one for that week. Dont do as i did and waste hours hunting for a second :p you wont find it. EDIT: to those saying youve found them multiple times it is a glitch, it is intended to only be 1 per character per week, consider yourself lucky if you have found more but do not expect it to last long. Bashiok: "The intent is to only be able to loot 1 Trove of the Thunder King per week; however, we're aware that in some cases it has been possible to loot more. We've either addressed or are working to address the few and very rare instances where it's been possible to loot more than one." Can anyone maybe deliver any time frame about the respawn ? I tried 48,0 82,1 from time to time and await the respawn but unfortunately I cant give any note or information exactly to crowded! This is the response I got after asking a GM about the Trove of the Thunder King chests, and "The Key to the Palace of Lei Shen"
I asked how often you can loot the chests, and if you can still find the keys despite having already done it for that week. Game Master Nibynoqq here. I'm just getting back to you regarding your issue with the Trove of the Thunder King. Important note: You CAN'T open them while in combat. I learned that the hard way as I watched someone open it right before my eyes. I talked to a GM today and he said that there is NO limit on how many a toon can find in a day. I've searched all over and can only find instances where it's the Rare mobs dropping the stone that's 1/week. If someone can please point out (with a link or image) any information confirming or contradicting this for the CHESTS, I would be grateful. I found and looted four of these is one day and six total for the week so far. Maxxed on Elder coins so the Fortuitous Coffers sit in my bags for now. I used Tomtom and was looking for them because I wanted to know where they were. I am on a low pop server. Please don't nerf my one joy in life. I'd like to warn people who find a trove of the thunder king in the area Jhgaluk Crag - the area where you get the buff skin of saurok automatically to do the dailies over there..
Two times it happened to me that I was Shapeshifted when trying to open a chest, then it does open but because you open your chest your shapeshift breaks but you shapeshift back again after a second or 2, and when you do your loot window disappears. It happened to me a couple of times that I couldn't open the chest anymore when this happened, and it just disappeared without having looted it, so keep this in mind.. Anyone have tips how to avoid it? I now just tend to just pull a mob and stun it while i'm looting the chest.. when you're in combat you can't shapeshift automatically. There have been several posts regarding the Chests on Thunder Isle. You can find more than one, I have and several guildies have as well. I am not "glitched" my guild isn't glitched" I have found chests and I open them, there is no secret code, there is no scam, there is no glitch. I have found more than ONE chest per week, opened the chests, looted the chests and used the items looted. 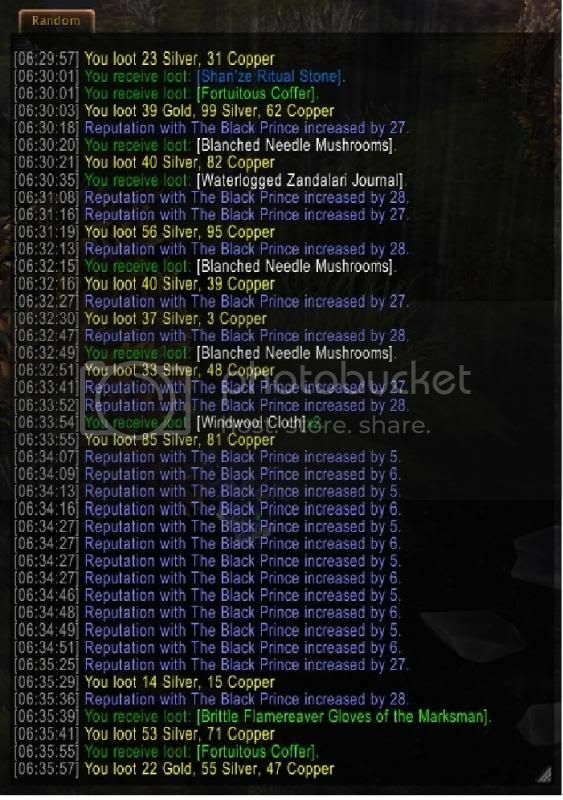 I have done this several times, as far as I can tell there is NO Limit to how many CHESTS you find on Thunder Isle. Take my word for it, the person telling you can't find more than one is a liar. If you are like me and have more than just a handful of 90's its easy to forget. If it returns a 1 you have looted it. If nil, you have not. I have old Find Treasure still active on my dwarf rogue, so I was able to find two chests, loot second then come back and loot first - very fast, about 1-2 minutes apart. There seem to be some small time before you are unable to loot more, since I saw third one disappear right before my eyes about 5 minutes after. So, if you are really lucky and find two chests very close to each other, you just might be able to loot both. Find a chest, don't loot it, find another, loot it, come back and loot first. If you're fast, it'll work. It's possible to loot more than one chest a week on the same toon but you need to be quick, there seems to be a window of 5-10min were you can loot a second one but after that you can't see them. I looted the second chest 5min 54seconds after the first. edit: made a ticket, I'm curious what a GM has to say about this and if he's even aware that it's possible. Please note, If you are unlucky enough to find you have no inventory spaces, then you get attacked the chest will disappear and you wont get your key. I am now waiting to see if i get the chance to find a second chest as i don't have the key from the first. Here is how to get a lot of Troves each week. 1) Download and instal TomTom or another waypoint macro. 2) Set it up and add the waypoints at the end of this post. 3) Check out each waypoint and save them. 4) When you have checked all, just begin to open all the troves. You will have about 5 minutes to open them from when you open the first one. - Try to not pull a lot of mobs, because you cannot open the trove when in combat. - Plan a good route ahead. - You could get 4-6 troves each week doing this. - Doing it at the end of the week is much better than at the start, since very few people will compete for the same troves. - Also try doing it a non-peak time for the same reasons. All credits for the waypoints go to the WoWHead user BlazeFlack. I found two chests and my friend couldnt see any of them, i opened two in like 5 minutes. So it´s not like 1 per week. I can confirm you are able to get multiples per week. It takes time for the server to "flag" you as completing the "quest," as this counts as a weekly "quest." However, AFTER the server finally flags you as complete, THEN you are unable to open more until next reset tuesday. The intent is to only be able to loot 1 Trove of the Thunder King per week; however, we're aware that in some cases it has been possible to loot more. We've either addressed or are working to address the few and very rare instances where it's been possible to loot more than one. if you find one of these while in a group. LEAVE RIGHT AWAY. your group mate will come to you and steal it while you are cleaning bagspace. It's said that another player cannot see your chest. Need to check with guys not opened this week yet. These CAN looted with a character below level 90. Confirmed by me on my level 86 hunter that was summoned to the Isle of Thunder. Am I the only one who thinks it's weird that anyone can literally walk up to them and loot them with no strings attached? These chests sit unlocked, unguarded and in random locations where anyone can access them while Lei Shen's Burial Trove in the scenario not only ask for a key to open, but also require you to go through traps, avoid mobs and bypass defenses just to get to them. Shouldn't it be the other way around? Why make them require keys to unlock if they're so heavily protected? You get to the end of the scenario but you are not guaranteed to open any chests. Only the gold/coins/ritual stones you might find. Don't know if anyone will understand what I meant to say, but I just wanted to put that out there. Are these chests meant to be once a week per account or per character? Looted one on my paladin early during the week, then tried finding one on my mage, and after running around for an hour looking at the spawn points, I have yet to find one. These are really really easy to find if you haven't found yours for the week. My tracking quest to find one of these did not reset this week on any of my characters so I have been unable to find any of these. Anyone else experiencing this problem? taken from princeofravens comment, but the amount of characters prevented a reply on the top. Last week I found two of these in the same day, which isn't supposed to happen... Anyone else? Looted more than one same day (within 5 minutes of each other). this supports Ardinur's post - please upvote his post for future wowheaders thx. As of 7.0.3, I haven't seen one of these on the island in months. Are they still around? I most of the time find two chests when I immediately change the cell. Oh yes, changing the cell, I never found one in the same cell as the first one. There are like eight cells on the island, maybe a few more. found a second one and waited in clicking distance of it. Past the three minute mark I opened the chest. So if it is on a timer there are at least three minutes to get from one chest to the next. Edit: Did this again, opened a trove, started the timer, went to the next cell, found annother one and waited for it to despawn. After ten minutes on the timer I opened it. It is more complex, this is not just a simple timer triggered by opening the first trove. Edit: and I just looted three chests. Changing the cell is key, if you found one, ignore all possible spawn locations in that cell and move to the next one. I normally loot two now and do not look much further. This object can be found in Isle of Thunder (111).